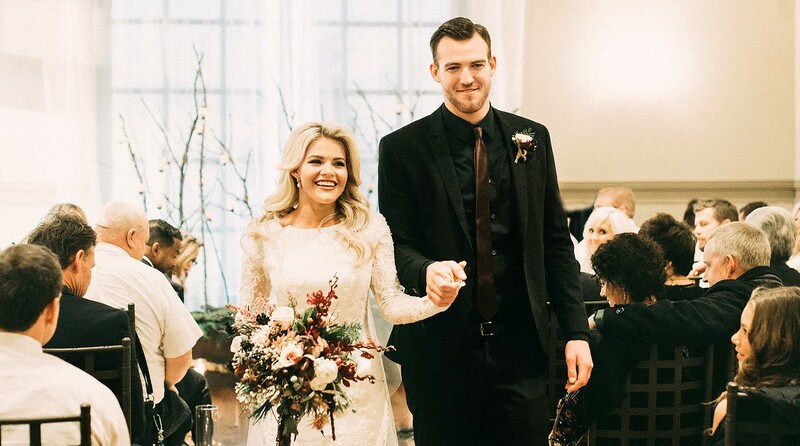 Love was in the winter air as Witney Carson married her high school sweetheart, Carson McAllister, on New Year’s Day in a wedding ceremony that dreams are made of. The Dancing With the Stars professional dancer, 22, has graciously shared her gorgeous wedding photos exclusively with The Knot, and fans are sure to be impressed by this lavish wedding, which was planned in three short months. “Witney and Carson’s ring ceremony was filled with laughter, happiness and joy,” celebrity wedding planner Michael Russo told The Knot. India Earl Photography captured every memory-making moment of the New Year’s Day ceremony and reception. The newlyweds’ rings were featured in a shot along with their beloved wedding invitations, which were created by Ceci New York. Carson wore a Rivini gown by Rita Vinieris with long sleeves and intricate lace detailing, which was the perfect dress for a winter wedding. “Witney was the most relaxed bride I’ve ever come across,” Russo recalled. “She was able to enjoy every single moment of the day.” Vivian Johnson created Carson’s impeccable makeup, while Dean Banowetz, InStyler Global Artist and the InStyler Style Team, transformed her already lovely locks into picture-worthy perfection for her wedding day. Many of the bride’s fellow DWTS dancers were bridesmaids including Emma Slater, Lindsay Arnold, Jenna Johnson and Brittany Cherry. The bridal party wore fawn Amsale gowns with matching wraps, perfect for their snowy surroundings. The bride and groom gave their bridal party gifts of monogrammed clutches for the girls and wallets for the guys by Gigi New York. Actor/director Alfonso Ribeiro, who won season 19 of DWTS with Carson, attended the wedding. He was joined by his wife, Angela Unkrich and their sons, Anders Reyn Ribeiro and Alfonso Lincoln Ribeiro, Jr., who served as Carson and McAllister’s ring bearer. 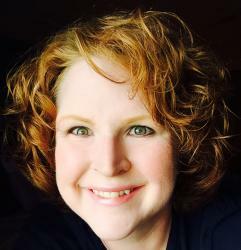 With help from her wedding planning crew, Carson enjoyed the creative planning process. “I loved getting to pick the decor and the flowers,” the new bride shared with The Knot. “I think that’s what makes a wedding, and I got to use my creativity, which I love to do!” Carson’s husband and father-in-law also contributed to the decor by building a candle centerpiece suspended from the ceiling. L Floral Studio designed the bridal party’s bouquets and floral decor for Carson and McAllister’s special day. The reception took place at Noah’s Event Venue in Lindon, Utah. The venue decor had a “rustic, woodsy” feel, which continued the couple’s theme from their magical engagement photos. The newlywed’s receiving line took place from 6- 6:45 p.m., and the reception was from 6-8 p.m., leaving plenty of time for the lovebirds to reflect on their perfect wedding day. According to State Street Feed and Supply Caterers’ Facebook, “Witney Carson’s wedding guests enjoyed prime rib, salmon, grilled chicken for dinner and a delicious hot cobbler bar for dessert!” Sugar Kisses created the naked wedding cake which was presented on top of a tree stump. Guests were also treated to Sugar Kisses cupcakes, which included flavors like “chocolate grasshopper” and “red velvet.” Tying in the winter wonderland theme, a hot chocolate station by Styled by Jenni was available to guests. Carson was sure to offer plenty of sweet treats to her closest friends and family. Carson and McAllister’s wedding day wouldn’t be complete without a post-ceremony dance. “My favorite moment of the day was [when] Witney and Carson broke out into a 30 second fully choreographed routine after their first dance,” Russo (pictured below with the newlyweds) told us. “It totally set the tone for the rest of the wedding reception, which was fun, fun, fun!” Despite her perfect, form-fitting dress, we just knew the DWTS professional would show off some moves. But it was an unexpected moment that touched the new bride’s heart. “My favorite part of the day was when my cousin read a note from my brother Jaxon (who’s in France),” she recalled. “It was so heartfelt and honestly made me feel like he was there.” McKenna Fullmer shot the couple’s wedding video, which is surely filled with memories they will continue to relive for years to come. This happy couple sure knew how to kick off 2016. Congratulations to the new Mr. and Mrs. Carson McAllister! May the dance continue for a lifetime to come. 5 Comments on "Witney Carson and Carson McAllister’s Wedding Photos"
Beautiful wedding.. I follow Mr. Russo’s wedding.. He does an incredible job! On the bridesmaids’ picture, the first girl from left to right is Jenna Johnson, one of Witney’s best friends and also a dancer from DWTS !! Yeah, you guys missed that at least 4 (not 3) of the bridesmaids are on DWTS. You definitely missed Jenna. There might be another one, too. I love that her dress is long sleeved and modest…very classy and beautiful. It’s not what we are used to seeing on brides these days, and I really like it. She has to wear such skimpy outfits for her job, I’ll bet she was more than thrilled to cover up….. for the very least that it was well below freezing that day. Whitney is LDS (Mormon). LDS brides go the modest route because they have to look modest for their “sealing” ceremony inside the temple. So it really wasn’t by choice. But regardless, her dress is really pretty! Such a beautiful wedding and to have it on the winter time looked beautiful. Can you tell me where Witney Carson got her heels from? I want them. So happy she had beautiful wedding and she looked like a princess on her big day. Everyone dreams to be like that!